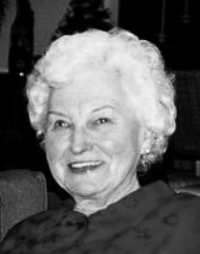 Valentine Uzans Bandrevics, born Aug. 10, 1915, in Cesis, Latvia, passed away gracefully Jan. 20, 2013, in Bozeman, Mont. She lived a long and amazing life, strong and vibrant until the age of 97. Valentine was the daughter of Peteris and Olga Uzans, and older sister to Ausma Mednis. She graduated from the University of Latvia with a master’s degree in language and music. Valentine was musically gifted as a singer and pianist, talents that could have taken her to the professional level if the events of World War II had not interfered. Valentine married Normunds Bandrevics in 1938 and they shared a loving 60-year partnership until his passing in 1998. Prior to the Soviet invasion of Latvia, many Latvians tried to escape with little warning or time to prepare. Valentine was forced to leave her home and belongings behind, boarding a train with her 3-year-old son, Vidvuds (Jack). Her husband would later join her in Germany, after the war had ended, where the family would spend the next four years in displaced person camps. Most of Valentine’s family and friends were able to escape during the Soviet invasion, but many who were unable were killed or sent to Siberian prison camps. In 1949, the family had an opportunity to leave the DP camp and move to America. With the support of a small community in Blueridge, Va., Valentine and Normunds moved into a one-room cabin with no running water. In spite of its limitations, this was the place where they would begin to build their life in America. Normunds and Valentine took any available jobs to provide for their family. With determination and hard work, they eventually were able to buy a home and send their son to medical school at Ohio State University. In 1979, Valentine and Normunds moved to Washington state to join their son Vidvuds (Jack), his wife, Sharon, and three grandchildren, Krista Sampson, Erika Di Ruggiero and Aleks Bandrevics. Valentine was the ultimate grandmother, always loving and hardworking for the benefit of her family. She kept her Latvian traditions alive through language and cooking. Much of her life was spent cooking for family and making sure that delicious Latvian treats were present at every family birthday and holiday. Some family favorites were pirags, dzeltenmaize, black bread and piparkukas. Valentine spent a great deal of time with her grandchildren, whom she loved dearly. She had a way of letting her family know that from deep in her heart, she believed each of them to be perfect in every way. She gained two grandsons-in-law, John Sampson and Paul Di Ruggiero, and three beautiful great-grandchildren, Cole and Ivy Sampson and Mia Di Ruggiero. She was a very proud great-grandmother. The final six years of her life were spent at Birchwood Assisted Living in Bozeman, Mont., where she loved the staff and enjoyed her nice corner room with beautiful views of the Bridger Mountains. She cherished the phone calls and visits from her family, who will greatly miss those times spent with her. She was an amazing woman who persevered through hard times and created a lasting foundation for a beautiful and loving family. She will forever live in our hearts and memories. Arrangements are in the care of Dokken-Nelson Funeral Service, www.dokkennelson.com.